Each game turn has seven rounds but it’s the Marshalling and Challenges rounds that make up the meat of the game. 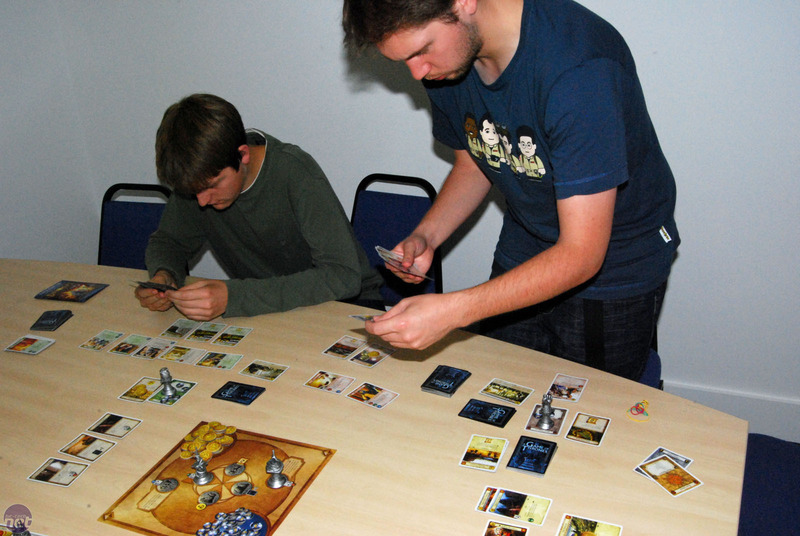 Here the players play their cards using their gold (marshalling) before then issuing challenges based on the strengths and abilities of their active characters. There are three types of challenges available - military, intrigue and power - each of which has a different outcome. It sounds simple but things get complex very quickly as once characters have been used to attack ('knelt' in in game parlance), they aren’t available to defend and vice versa. This means that plans change on the fly as players before you carry out their challenges and use up their character resources. Plan carefully to who to attack and when. The challenges round is often brutal too; each successful military challenges automatically kills one of your enemy’s character cards permanently meaning it’s not worth getting sentimental about any of them. This can be a frustration as it makes many of the character cards, even the more powerful ones, feel fragile, with many failing to live up to the bad-assedness of their in-book counterpart. Still, it keeps the game moving quickly and means that you need your weaker characters (which effectively act as shields for your stronger ones) just as much as your all singing all dancing death merchants. The fluid nature of the challenges phase and the way that titles are dished out means that the playing order is also an important facet of the game; it can be useful to go last during the challenges round but the first player gets the first pick of titles, giving him more control. The playing order is decided randomly turn by turn with whoever draws the plot card with the highest initiative choosing who goes first. It’s an elegant system and means that the privilege of going first (or last) shifts around the table, keeping the gaming fluid and adding an extra layer of tactical depth. Don't get distracted by fights - it's the blue Power tokens that win the game. The plot cards themselves, as well as deciding who chooses the player order, also add turn-long special rules to the game. Each player has a deck of them, so there can be up to four of these special rules or conditions in play at any one time. These are generally quite well balanced and fun with the exception of the Valar Morghulis card of the Stark plot deck. This card kills every player in play which while dramatic, can’t half screw up a well poised game or carefully constructed plan. 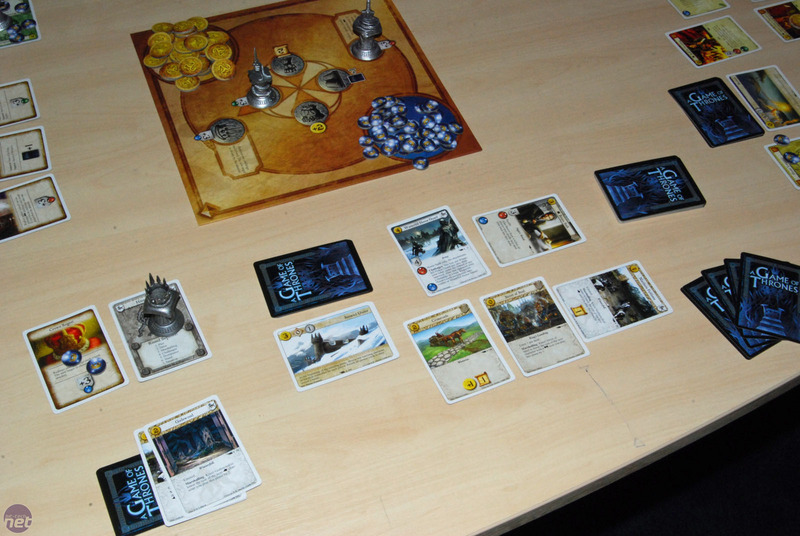 Despite the Valar Morghulis card being annoyingly over-powerful, we’ve thoroughly enjoyed our time with the A Game of Thrones: The Card Game; it’s fun, challenging and relatively easy to pick up, though you’d want to make sure you had a group of friends who were up for playing it a number of times to really get your money’s worth out of it. It’s also clear that there is plenty of extra depth there for those who want to explore it; some of the cards and mechanics that the rule book talks about only come into play once you’ve purchased some of the expansion decks. The biggest compliment that we can pay the game is that it really captures the spirit of the world which it portrays. The combat is brutal, the titles get passed around quicker than a cold on a Tube train and alliances are formed, broken and forgotten about without a second thought. It’ll certainly keep us entertained during winter.